Summer is coming, and that means so is the heat. On one hand, this weather is amazing because it means pool time, beach, or lakeside afternoons, and lots of days with the windows open. On the other hand, few people enjoy being too hot, sweaty, and sticky. Using a fan in your home can increase air circulation and help make your home feel cooler. When used with the air conditioner on a lower setting, fans swiftly move cold air room to room and help save on energy bills. Before buying a new fan for summer, read the following tips to ensure your fan will be used for maximum effectiveness. Buying a new fan for warmer weather? Decide before you buy what you need from a fan, and where it will go in your space. Fans come in many shapes and sizes, meaning that it isn’t a one-model-fits-all mentality. Before you purchase a fan, take a moment to look at your room. How big is it? How tall is the ceiling? How many windows are there? Where do you want to set the fan – on the floor, in a window, or mounted on a wall? All of these factors can influence which fan you purchase. Spaces like living rooms, family rooms, and dens may benefit from a tower fan, pedestal fan, wall-mount fan, bladeless fan, or an air circulator fan. Bedrooms tend to be smaller, and have a variety of options (visit Choosing the Right Fan for Your Bedroom for more info.) There are multiple fans that can suit your needs, and placement is just as important as fan type or size. (For more info on the best types for hot weather, visit 5 Types of Fans to Use in Your Home This Summer.) 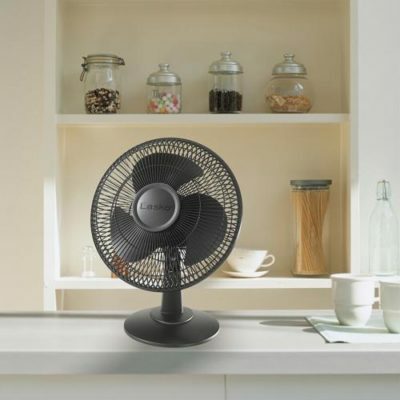 Knowing where you want to place your fan can inform the fan you buy. A basic science lesson is that cold air is naturally heavier than warm, meaning it will sink to the area near the floor while the hot air occupies the higher space. If you have a room with no breeze, this is how the temperature will settle 100 percent of the time. The good news, however, is that even cold air is relatively light and easily influenced by outside sources. Placing a fan in a room will disrupt that balance and can force the cooler air to go where you want it to be. However, fan placement matters. 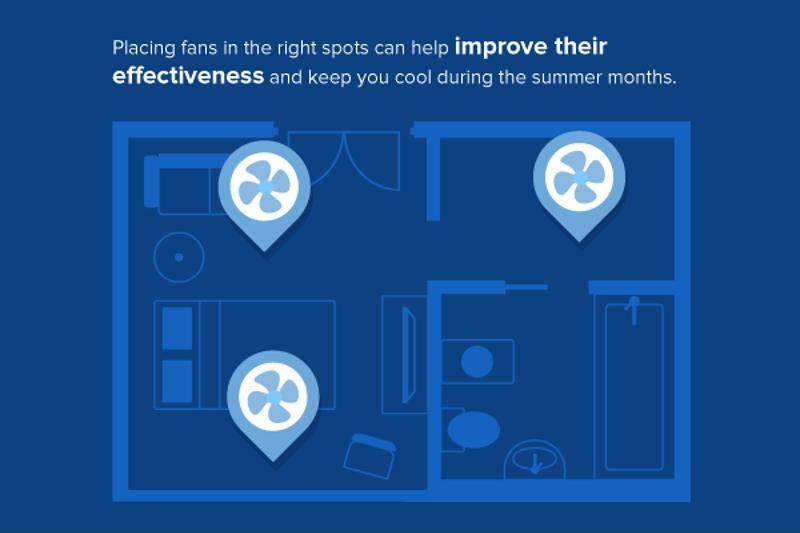 Place your fan so that it faces the opposite wall from where most of the activity takes place in your space. This approach will drive the air to the surface, where it will bounce off, mingling with the rest of the air and cooling the space. Ideally, if lower temperatures are your main goal, you may want to choose a fan that’s lower to the ground so that it scoops up all that refreshing chilliness along the way. fit securely and tightly in the open window, keeping all bugs outside where they belong. A twin fan, like the Electrically Reversible Twin Window Fan with Remote Control, can simultaneously pull fresh air in while pushing out stale air, creating circulating air that’s crisp and clean. The furniture in your space will help in determining where you should put your fan. Placing a table fan or a window fan will depend on the room’s décor and arrangement. Table fans will need a clean flat surface close to an electrical outlet to operate. If the cord of the fan impedes walkways or causes a tripping hazard, it’s not the right placement. Window fans should not be blocked by furniture, and cannot help circulate air if a sofa or curtains are in the way. Always point fans away from tables or desks with loose papers or light objects; picking up a mini-tornado of paperwork isn’t relaxing. Fans are most effective when they have an unobstructed pathway in front of their blades. A wall-mount fan is placed high above any air obstacles. Many come with a tilt-head feature (like the 12″ Oscillating Wall-Mount Fan with Anti-Rust Grills) so that the force of the fan can be pointed in the direction where it is most needed. Do your best to give your fan this path so that it may carry the air farther, increasing its effectiveness in your house.